Get the power and performance of Braille Sense U2 MINI’s 1 GHz Mobile CPU, 32 GB storage capacity and enhanced features such as extended battery run time, improved GPS receiver sensitivity and the addition of a vibration motor. 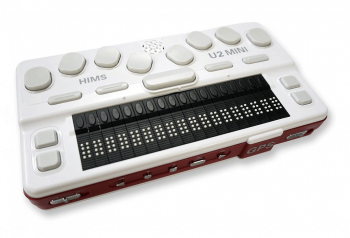 U2 MINI also comes with an optimized Windows-based operating system with a familiar, Windows-like user interface. Teachers, rehab counselors, AT specialists and other professionals will appreciate the new robust hardware and now-standard capabilities of our proprietary Sense v8.0 including Excel™ Viewer, YouTube™ and Dropbox™ applications. Users will enjoy the power and performance of a 1 GHz Mobile CPU, a 32 GB storage capacity and enhanced features such as extended battery run time, improved GPS receiver sensitivity and the addition of a vibration motor. 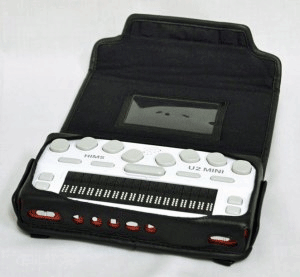 U2 MINI also offers more stable performance than other notetakers, with an optimized Windows-based operating system with a familiar, Windows-like user interface.